Everyone has it - the fabric you just don't like anymore, that you got in a sack of scraps that you never liked in the first place. I know I've got some, and I haven't been sewing all that long, so I'm sure you've got some, too. I'm talking about fugly fabric. 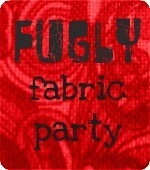 Lucy at Charm About You had the great idea to host a Fugly Fabric Party - a link party in which you post a lot of fabric that you're just not that into, and make it available to one of your followers - maybe just a giveaway, maybe a FQ-for-FQ swap, who knows. It's up to you! She's proposed February 7th as the date for this. I'm pretty excited about it, as I've got some FQs to put up for grabs, as well as a big piece of backing fabric...so spread the word! Yeah!! Thanks for posting about it and for joining in the party! I maybe should have gone with "Fabric, I'm just not that into you!" - Bit long to stick on a button though! !